The 1966 2c coin was the highest mintage 1966 coin and was minted at the Melbourne branch of the Royal Mint (66,575,000 coins), the Perth branch of the Royal Mint (217,735,000 coins) and the RAM in Canberra (66,575,000 coins) . Distinguishing the mint of manufacture of this coin is done by looking at the front feet of the frill necked lizard. If the right most claw of the front right foot is blunted then the coin was minted in Perth. 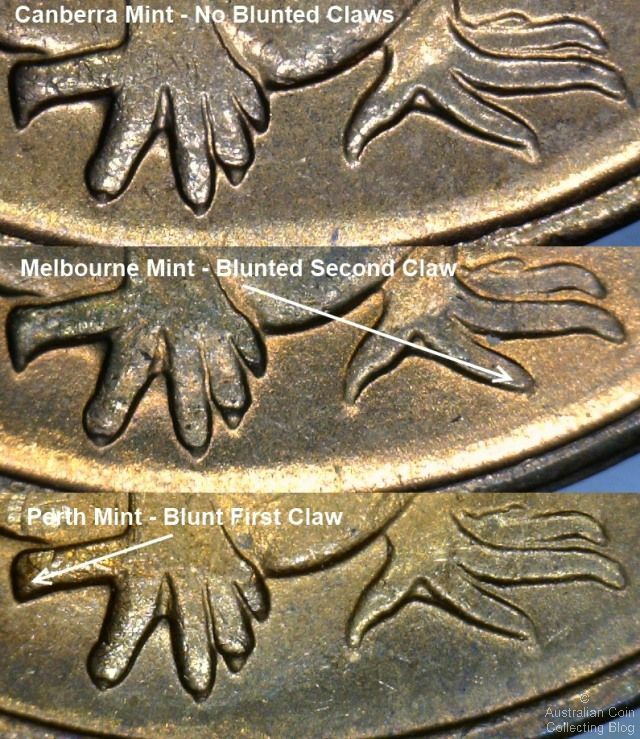 If the second claw from the right on the left foot is blunted then the coin was minted in Melbourne. If there are no blunted claws then the coin was minted in Canberra. The image above shows the Canberra minted coin at the top with an indicator of which claw is blunted for the Melbourne minted coin. The bottom image is of a Perth minted 2c. Thanks to Stuart Andersen Coins for the supply of some of the coins used in this article.